The word empanada comes from the Spanish and Portuguese word empanar, meaning to wrap in bread. Traditionally these pastries are stuffed with tomatoes, garlic, and meat or fish. 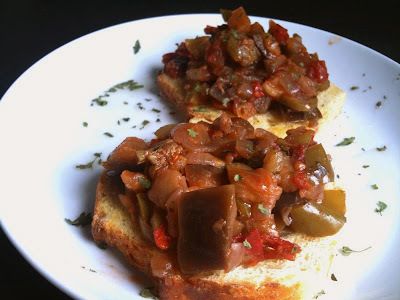 I substituted the meat for tofu and vegetables for this recipe. You can also try it with vegetable protein (tvp) for a more authentic texture. In a medium-size pan, sauté the onions and garlic in olive oil until clear and golden. Add the diced bell pepper, zucchini, mushrooms, and tofu and sauté for another 10-15 minutes. Add the spices and crushed tomatoes and simmer for 15 minutes or until the sauce thickens. Add the sugar and simmer for 5 more minutes. Set filling aside to make the dough. In a mixing bowl, mix the flour and salt until combined. Mix in the butter, egg replacer, and water until a thick dough forms. Roll the dough into a ball and let cool in the fridge for 30 minutes. Divide the dough into 6 small balls and roll into thin disks with a rolling pin or cup. Fill the disks with 3-4 tbsp filling, fold over and press the dough together firmly. 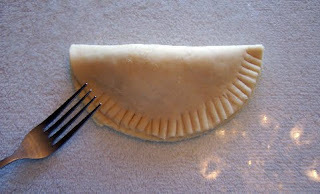 Crimp the edges with a fork (but careful not to pierce the empanada). In a deep saucepan, heat the 2-3 cups olive oil on medium heat until hot. Put the empanadas, one by one, into the hot oil and flip once to cook both sides. Each side takes about 2 minutes to cook. Here is a good tutorial on how to fry empanadas.